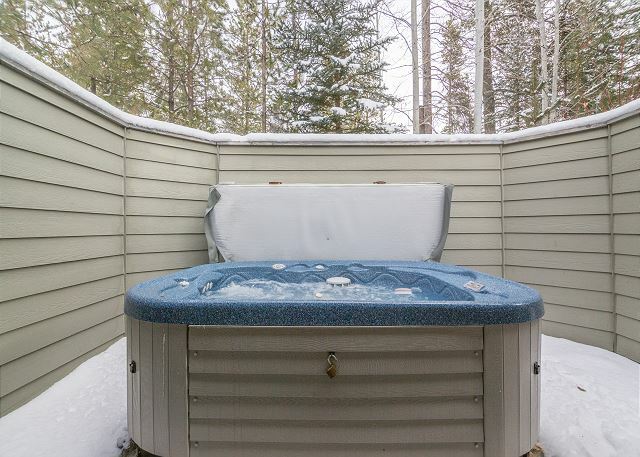 Walking distance to the mighty Deschutes River, in the heart of Central Oregon, is your vacation perfect dream home with the luxuries that only Sunriver can offer! Whistling Swan Lane #2 is a gorgeous 3 bedroom home with a private hot tub, enclosed deck and private grassy lawn area. Step inside this home into the grand living room area with a flat screen TV, leather recliners, large sofa and gas fireplace. 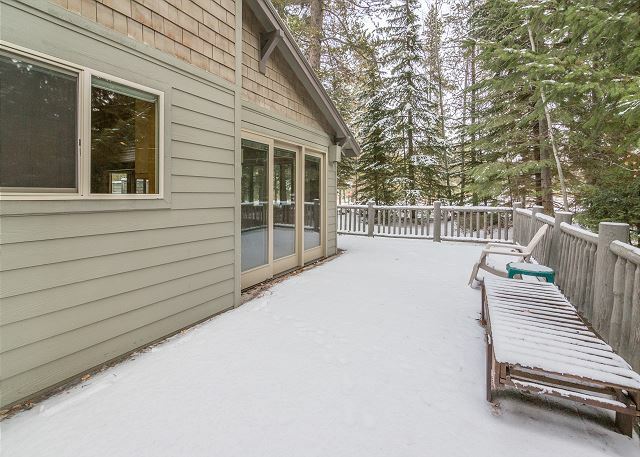 The living space leads to the open dining room area with plenty of windows to let in Sunriver’s year round sunshine! The kitchen is stunning! Spacious, it features well-stocked custom cabinetry and stainless steel appliances, instant hot beverage water faucet and is fully stocked with necessary cooking utensils. 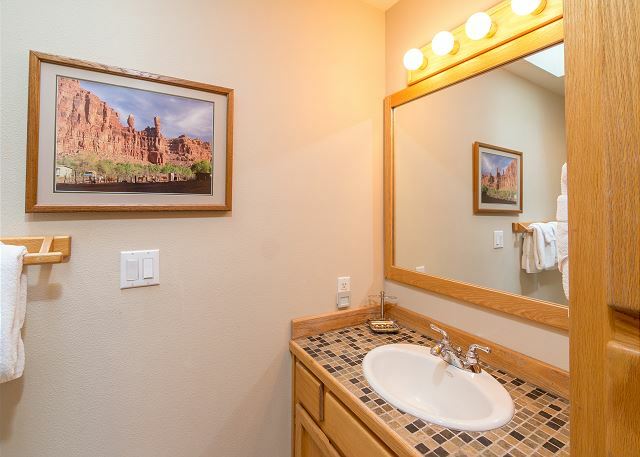 The master king suite has a large walk in closet, private bath with jacuzzi tub and personal access to the private hot tub. This home is perfect for an adult’s getaway with a second bedroom that has a queen bed and TV. The third bedroom/office has a comfortable sleeper sofa, desk and TV. Set your laptop on the desk provided and stay connected! Whistling Swan has free WiFi! The beautiful enclosed deck wraps around the home and is equipped with outdoor furnishings, gas BBQ and landscaped lawn. The garage provides bikes, foosball table and indoor-outdoor ping-pong table. This home provides 8 Unlimited SHARC passes, free tennis, free Mt.Bachelor ski shuttle and free access to the Sunriver Marina! everything was great. The weather, the house, the food. Thank You for the 5 star Review, Patty! Happy to hear everything was great! Come back soon! Located near river and bridge which is one of my favorite spots in Sunriver. Had minor problem with remote and management had repair man there in 30 minutes or less. House is roomy and I love the gas fireplace. Great choice of bicycles which saves a nice chunk of change on renting some. Thank You for your 5 star Review, Richard! So glad that you enjoyed the location, the bikes and the fireplace and that we were able to provide speedy service when you had the minor remote issue. Come back soon! We had a great time again in this vacation home.. the kitchen is huge with an eat- on island. There is a large dining table for big groups. The living room is a little small but there is a third bedroom/study that has a couch when needing more space. The TV is small but worked fine after we figured out which remotes to use. The Master is large and has a large closet. I enjoyed the big soaker tub too. There were several areas that needed upkeep. Front porch is warped and had caution tape on it. White rugs had big spots, and the patio umbrella was broken. All things that will probably get fixed. The location was perfect for hopping on the trail along the river. Loved going down to see the sunset! Thank You for your Review, Sharon! We are delighted to hear that you had a wonderful time and enjoyed the large kitchen and dining space. Come back soon! The layout of this house is amazing and fit us very well, but the house is looking very worn. The beds were very uncomfortable and the carpets are permanently stained. The decks are almost unusable. Very sad as we have had good times in this house. The location is amazing with good bike trails nearby. It is one of the few houses with AC which we needed during the week. Thank You for your review, Mark. Glad to hear that you enjoyed the layout and location and made use of the bike trails and A/C! I will have my maintenance staff take a look at the items you mentioned. We hope to see you again! We really enjoyed our stay at this well-appointed home. Beds were very comfortable for us and the bikes and ping pong table were much appreciated. Usually my husband spends time working on whatever bikes are provided, but these were in good working order. The hot tub was great to relax in; would suggest installing some hooks nearby to hang towels up for when you get out. Sunset Lodging's service was terrific - we ended up arriving a bit earlier than we thought and they let us in ahead of schedule. Any initial questions / concerns were handled quickly and cheerfully. We loved the location of this house so near the river and hope to stay here again in the future. Thank You for your AWESOME Review! We are so happy to hear about the wonderful times our guests have when staying with us and aim to please when it comes to the service that we provide! Glad our staff was able to answer any questions and help out with an early check in. We hope that you will come back to visit us in Sunriver again! Whistling Swan #2 is a wonderful choice and definitely offers the relaxation factor, glad your hubby was able to take a "vacation" on his vacation as well! Very nice. Loved the gas fireplace. Great location especially if you want to be near the river. Would definitely stay here again. Thank You for your review! We are happy to hear that you enjoyed the cozy fireplace and beautiful river location. We hope to see you again! We enjoyed our stay with Sunset Lodging. We have been coming to Sunriver for 40 years and Sunset is the best. We look forward to our winter visit. Thanks for everything. We appreciate your review Jason! We're glad you enjoyed your stay at Whistling Swan #2 and hope to see you again soon! Great house. Loved the location and layout of the home. Thanks for your review Jeff we appreciate it! Glad you enjoyed your stay, we hope to see you soon! Whistling Swan 2 is a lovely home in a great location near the bridge. 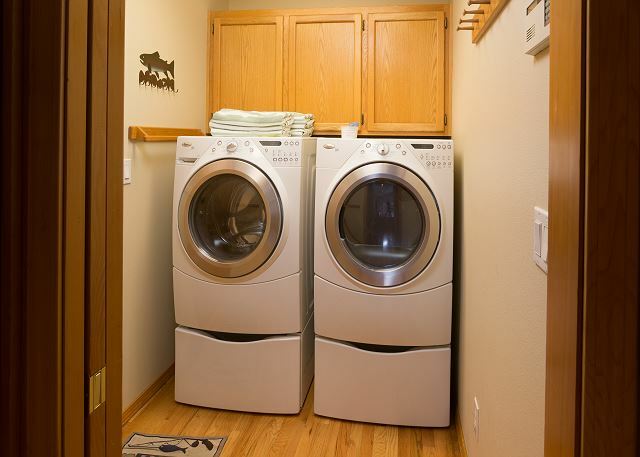 It has air conditioning which is great on hot Sunriver days! The place needed a little TLC before we arrived. We had to call the property managers several times for an appliance problem to light bulb out over bathtub. Kitchen faucet was not attached but fortunately, our guys could fix it without a wrench. 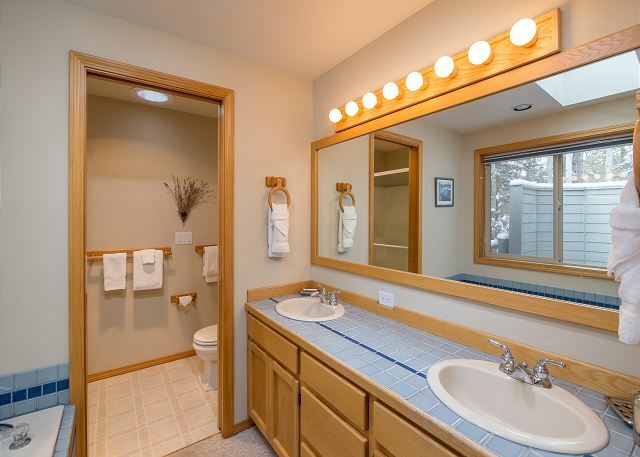 Sink and toilet problems that a Housecleaner should have seen. Overall, loved the place, and will return next year! Thanks for the review Sharon! We are glad we were able to get the issues fixed for you and apologize that they were missed upon your arrival. We hope you come visit us again in Sunriver soon! This home is a perfect fit for a small family or two or three couples. Nice kitchen and dining area with plenty of seating for a family. Close to the river and to the bike trails. General maintenance was good and the quality of the furniture was good. I thought that the kitchen floor was in serious need of cleaning and there were cereal crumbs left on the floor in the dining room. There are several bikes for the use of the renters in the garage. We bring our bikes with us, so can't comment on the condition of the bikes. All in all it was a good experience and value for us. Thanks so much for the review Erlene! We hope you had a great time in Sunriver and hope to see you again soon! The house was a great place to stay. Nice quiet location. Very clean. Good amenities. Will definitely stay here again. So glad to hear that you enjoyed Whistling Swan 2, Jamie! We hope to see you back in Sunriver soon. So glad you enjoyed Whistling Swan 2, Aaron!! Sometimes those items like salt and pepper go MIA if the guests prior finish them. We are ALWAYS happy to try to pinch hit from our warehouse if you find yourself in need of anything. Just give us a call and let us know! We hope to see you back in Sunriver soon! We enjoyed our stay at Whistling Swan 2. The kitchen is bright and well-stocked. The ping pong table in the garage kept the kids entertained in between biking and other activities. Overall, this is a nice vacation home for a smaller group. A couple recommendations are to make sure the patio furniture is clean for guests- we had to clean it ourselves. Also, the bed in the master bedroom is older and is probably due for a new one. We would also recommend bunk beds in the office room. 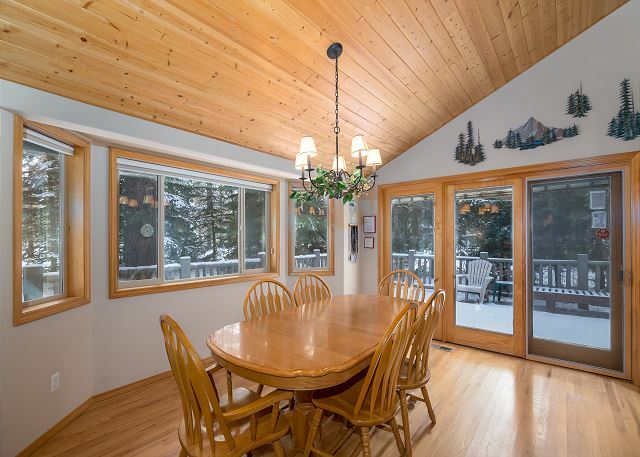 A great Sun River location! Whistling Swan 2 is a fantastic rental, in great shape with a beautiful kitchen space, hot tub, ping pong, foosball, and bikes galore. Located in a quiet loop away from the often busy Village, but close to the best sections of the bike trail and the river. Nothing bad to say about the place. We had a great time and will definitely consider this house again the next time we visit Sun River. So glad you had a good time at Whistling Swan 2, Marion! We hope to see you back in Sunriver soon! My children and I had a wonderful vacation at Sunriver. The house was terrific. The yard crew and hot tub maintenance team did a great job. We look forward to our next visit. Thanks Sunset Lodging. You are the best! We were very happy with this home. Very clean, very spacious. Perfect for a weekend with the Girls or a weekend with my family. Loved the large fenced deck and grass area. We all agreed we would rent this home again. This was the 2nd time we stayed @ whisltling Swan #2 on a winter vacation. Home was very comfy & clean. Alison & Krista are great help. I would highly recommend. Although. We had about 18 inches of snow on the ground and the driveway could have been shoveled prior to our arrival. Thank you Mark, for this great feedback. Alison and Krista are all stars and we are forever grateful for the way they pamper our guests. We're still digging some of our homes out of the snow, there just wasn't enough help in all of Central Oregon to get cleaned up in a timely manner (so...much...snow!) Obviously as a skier, you can see the upshot..... We're hoping for a late season, so keep us in mind for Spring Skiing! We stayed here for Thanksgiving. The house was perfect for us. Close walk to the river and had everything we needed. Cozy fireplace and hot tub were perfect. The house was extremely clean and warm. The weather was really cold and it snowed but we were never cold in the house. Want to stay here again someday! We're so glad you enjoyed Whistling Swan 2, Vicki!!!! 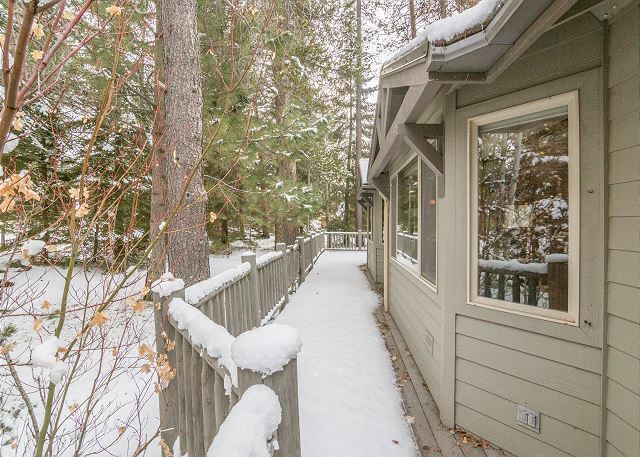 We hope you'll make it your home away from home and that you get back to Sunriver soon. It was a wonderful stay. House perfect, quite, everything we needed to feel at home. AND the weather was great. Thank you for your review! We are happy to hear that you enjoyed the layout of this home and were able to have some fun on the ping pong table. The location of this home is great for walking and being near the river provides for great views! I have forwarded your comments about the bedspread and curtains to our housekeeping manager to take a look at, I apologize for the inconvenience! We hope that you will visit us again soon! A fabulous place to stay! The house was amazing! Our hot tub was only 70*..I called the company & in 10 mins the spa guys were there to fix it. Very impressive! I am glad you had a great time. Hope to see you in the future. Sunset Lodging! I've been coming to Sunriver every year since I was a child,then with my parents and now with my own family.I've rented through many rental companies and stayed in many homes..This year we had the pleasure of staying at Whistling Swan #2 through Sunset Rentals..Everything was just PERFECT. The house was beautiful,very clean and well equipped, nice quiet area close to the river. This home is one of the few that have AC that's a plus in 95 degree heat. I really can't say enough good things about it. We just loved it. Thank you so much for allowing us to enjoy your beautiful home..We will be back!!! I have vacationed at this home several times looking for r&r and beautiful scenery. I am never disappointed. Hope that you were able to get the R&R you were looking for. See you again soon. Our family enjoyed our stay in this lovely home. It was very comfortable and in great condition. The kitchen was well stocked with utensils and dishes that might be needed. The bikes were all in excellent working order. The setting was gorgeous, and so close to the river. We will definitely stay here again.